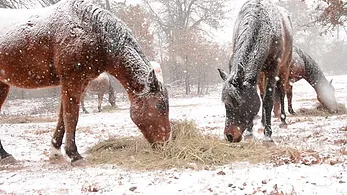 With the sharp frosts, rain, wind and snow that accompany the winter months, our instinct is to worry about whether our 4 legged equine friends are cold. We often rush out and put a rug or two on them. But are we actually doing more harm than good? Horses are very efficient at controlling their core body temperature when the environmental temperature is between around 5 to 25C, and in winter they can acclimatise to a wider range (e.g. down to -15C). The horses’ normal digestive process produces a large amount of heat. We will feel cold while our horses are still warm. In addition, our horses have various mechanisms to keep warm or cool down e.g. shivering, sweating, changing their metabolism, piloerection (raising the hairs which traps air). The brain controls these mechanisms and reacts to signals from both inside and from the horses’ skin. These signals give information on how cold/ hot the horse is and how cold/ hot the environment is and are crucial to controlling body temperature. Putting a rug on a horse interferes with this mechanism. Feeling your horses skin, in his ‘armpit’ or ears is not an accurate way of checking if your horse is warm. Unfortunately many owners do this, believe their horse is cold and over-rug him. Over-rugging can have negative effects on your horse’s health. For example, over-rugging may cause a horse to lose weight. An owner may think their horse is losing weight because it is ‘feeling the cold’, and so they put another rug on, which makes the situation worse. It is usually healthier for a normal horse to be provided with shelter and extra forage (hay etc.) rather than to use rugs. It fits well and is not rubbing or causing pressure points. You remove the rug daily and groom your horse to prevent fungal or bacterial skin infections developing. Your horse should spend some time each day where the skin is exposed to the air. Check your horse at least once a day to make sure his rug has not slipped or damaged, or that your horse has not become caught up somewhere. Wet rugs increase the heat loss from the body and prevent the horse from keeping themselves warm. Check rugs after rain to ensure they are still waterproof. Like humans, horses need UV light on their skin to make Vitamin D. Keeping the horses’ skin covered most of the time may lead to vitamin D deficiency. So, is rugging ever necessary? Horses that are ill are less capable of maintaining their own core temperature, particularly if they are eating less than normal. Some muscular problems also benefit from the horse being kept warm. Removing large amounts of the horse’s winter coat reduces its ability to keep warm by about a 5C margin. This can be countered by feeding the horse larger amounts of forage so they can generate more heat.